Jonathan Nez, right, stands with his wife, Phefelia Herbert-Nez, at the election night party for his presidential campaign on Tuesday in Window Rock, Ariz. Nez, the tribe’s vice president, had a significant lead over his opponent in the race for the tribe’s top elected post. FLAGSTAFF, Ariz. – Jonathan Nez has been elected president of the Navajo Nation and warned Wednesday of tough economic times ahead for the tribe with the anticipated closure of a power plant and the coal mine that supplies it. Unofficial election results from Tuesday’s election show Nez, the tribe’s vice president, overwhelmingly beat former two-term President Joe Shirley Jr. The loss was the second in a row for Shirley. Nez said he would start planning for his administration that will take office in January. He wants to restructure tribal government to avoid layoffs of tribal employees after the coal-fired Navajo Generating Station and the Kayenta Mine close at the end of 2019. Both are major employers on the huge reservation in Arizona, New Mexico and Utah, and officials have estimated that the tribal government could lose 30 percent of its revenue after they shutter. Nez said he would work with tribal employees in his attempt to escape layoffs. “If we can all commit to making these changes and reorganize some of these programs, I truly believe we won’t have to have any layoffs,” Nez said. Hundreds of Navajos who work at the mine will lose their jobs, while power plant workers are being offered other jobs with the Arizona utility that operates the generating station. Nez said he’ll leave economic development to his vice president, Myron Lizer, who manages hardware stores on the reservation. Outgoing tribal President Russell Begaye, who defeated Shirley in the last election, did not advance beyond the primary. Shirley said he told his supporters they ran a good campaign focused on business development, tourism and empowering small Navajo communities to impose local taxes. “I’m not going to go around with my head hung low,” Shirley said. About 98,000 Navajos were registered to vote in Tuesday’s election but some could not because polling places unexpectedly experienced ballot shortages. Steve Blackrock left a polling place near Pinon after waiting for an hour to see if more ballots would arrive. “It’s a sad feeling knowing that you weren’t able to participate in such an important day,” he said. The lack of ballots was traced to a measure that asked Navajos if they wanted to grant raises for the tribal president and vice president, said Jared Touchin, a spokesman for the tribe’s legislative branch. People who voted no were supposed to leave a second section blank that had different options for the raise amounts, Touchin said. Not everyone followed the instructions, causing ballot machines to reject the paper ballots that had too many marks, he said. Those voters were given a second ballot, causing some polling stations to run out. The salary increases were rejected. 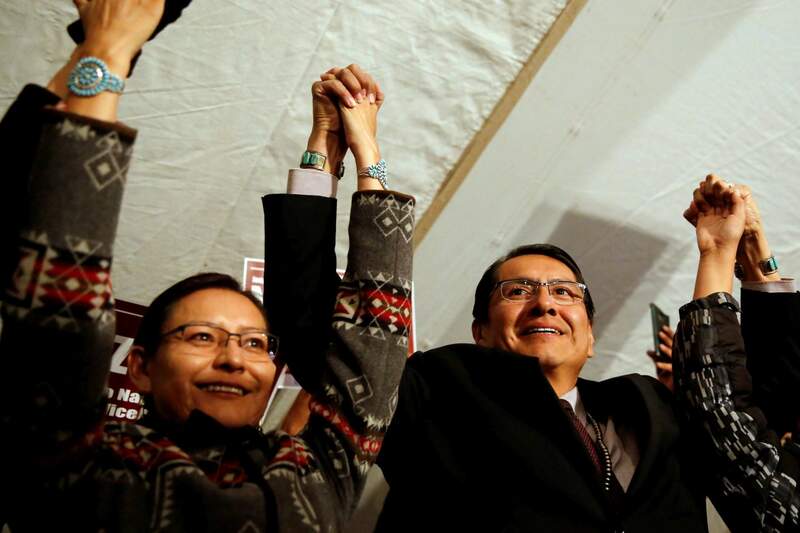 Voters also returned nine incumbents to their seats on the 24-member Navajo Nation Council, the tribe’s lawmaking body. Seven incumbents were beaten by challengers and eight races featured newcomers. Three women were elected overall. One incumbent lost in the August primary election.